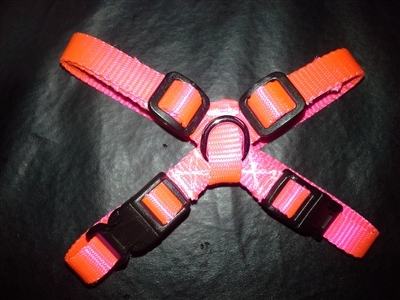 Our "X" fitted pig harness is fashionable, durable, and easy to use. Heavy duty stitched with an enclosed Welded Nickel Plated D-Ring to prevent irritating and rubbing of the skin. Specifically made with 2 plastic side release buckles so the pig does not need to "step into" the harness and designed in an "X" so that it wraps from over one shoulder to under the belly to the opposite shoulder to prevent choking the animal. Nylon webbing thickness is .07 to .075 of an inch with a breaking strength of 1400 to 5500 pounds. It has a melting point of 350 degrees and over 20 colors to choose from. Straps are washable and last a long time. Options include personalization, colored D-Rings and your choice of white or black plastic buckles and slides. Not only do the D-rings come in standard color as shown above, but they also come in over 20 cool colors. These colors are "powder coated" onto the metal. Please note that powdercoating may add 5-10 days of production time.